Timeframe: from April 2014 to June 2014. Size: around 55,000 words (183 articles). Team: 5 people, including 3 native-speaking translators acting as editors, 1 editor/reviewer and 1 project manager. Tanki Online is a multiplayer 3D-action browser game on Flash Platform. Players enter into tank battles with other users, destroy enemy tanks, help their team, upgrade their tank and advance their military career. The game includes numerous types of weaponry, several game modes and a chat. Our task was to localize all the pages of the wiki for the game Tanki Online. The customer provided us with access to the site through the WordPress system, expecting us to translate the text directly on the site. However, we wouldn’t have been able to ensure consistency in the translation while using the editor in WordPress, nor automatically find and fix errors related to the use of tags, capital letters, numbers and several consecutive white spaces. For this reason, translating each of these pages (numbering almost 200 in all) required some serious management work. In editing mode, we copied the page content into an empty text document, loaded it into the memoQ CAT program and processed the tags. After this, the translator began to work with the edited text. When the page’s translation was ready, the editor checked it in memoQ. We then exported it into a text document and copied the contents back into the site’s text editor. Some difficulties arose while we were translating the titles of all the pages directly on the site. Since the site’s template was in Portuguese, we had to poke around a lot to find the corresponding points in the settings. The next problem we had to deal with was the need to wikify (add wiki markup to) the translated articles. We had to make sure the internal links in all the articles were active, navigation was working and the article titles corresponded with what was in the link address. On top of that, we also had to check the formatting on all the pages: lists, quote formatting, type weights and so on. This work was done by the project manager as it didn’t require knowledge of the language, but instead knowledge of wiki markup and how WordPress works. In the final stage, we gave a native speaker, who hadn’t taken part in the project, several hours to check the site. In this localization project, we used the server version of memoQ, a translation memory program with an extensive database of terminology translations. The translators worked on the text within memoQ, using the source text directly on the website. All work on the site was carried out through WordPress. AlternativaPlatform is a developer of multiplayer online games and services. 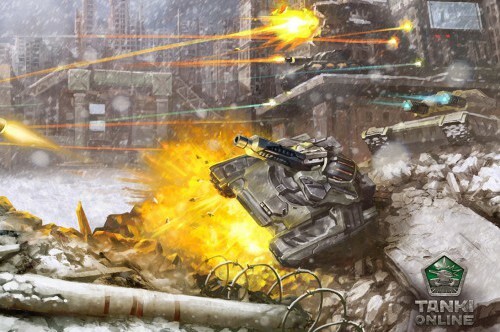 Over 5 million players from 50 countries all over the world play their key project, Tanki Online, each month. The product was declared the most popular browser game of 2013 and 2014 in Russia.